Animals Shirt Collab with Revel & Riot! We’re really excited to announce a new t-shirt collaboration with the LGBTQ rights organization, Revel & Riot! The shirt is about being born gay, and living your life as naturally as would a koala, a dragon fly, a dolphin — all animals that have been seen in nature to be gay. In fact, scientists have discovered that over 1500 species on this planet exhibit gay behaviour. LGBTQ homo sapiens are the only species that are punished, persecuted and repressed for being who they are. 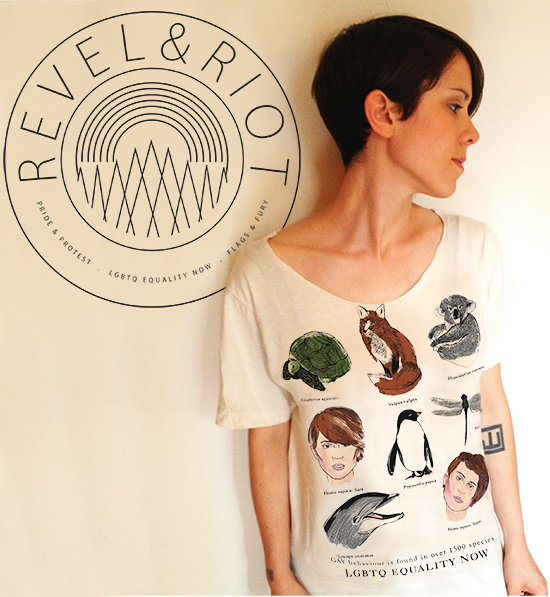 The shirt is available at teganandsara.com/shop and in the Revel & Riot store. All proceeds of the sale of the shirt go to benefit the work of Revel & Riot.